Bangalore-based online payment gateway startup Razorpay Software Pvt. Ltd has received an undisclosed investment from American payments and financial services company MasterCard, it said in a statement. Since late 2015, the startup has been working with the MasterCard Start Path programme that accelerates e-commerce and fintech startups and gives them access to MasterCard's network. "This marks a new chapter in the growth story of Razorpay. Being backed by MasterCard will give us added credibility to our technology. With support from MasterCard alongside other investors, we are on our path to build the gold standard of payments in India," said Harshil Mathur, CEO and co-founder, Razorpay. So far, Razorpay has raised $11.5 million from marquee investors like Tiger Global, Matrix Partners and Y Combinator. It has 33 angel investors including Kunal Bahl and Rohit Bansal (Snapdeal founders), Abhay Singhal, Amit Gupta and Naveen Tewari (InMobi founders), Kunal Shah and Sandeep Tandon (Freecharge founders), former chief product officer of Flipkart Punit Soni, Bill Gajda (SVP, global head of Innovation, Visa), Jeff Huber (SVP, GoogleX), Ram Shriram (board member and an early investor in Google), Justin Kan (Y Combinator partner and Twitch founder). It is the second Indian company to be selected for the Y-Combinator accelerator programme. 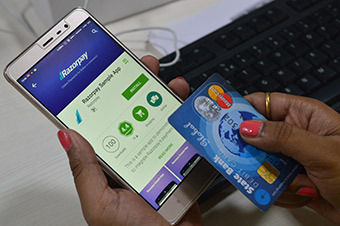 As part of the new funding, Razorpay said it is working with MasterCard to speed up the adoption of online and mobile payments among small businesses in India. It has integrated the MasterCard Payment Gateway to enable merchants and card issuers to authenticate each other prior to the authorisation of a transaction. "The work that Razorpay is doing in India complements MasterCard's solutions that are helping merchants accept online payments and grow their business," said Stephane Wyper, global lead for MasterCard Start Path. The company was set up in 2013 by IIT Roorkee alumni Shashank Kumar and Mathur. Kumar earlier worked with Microsoft while Mathur was working at Schlumberger before launching Razorpay. The company, which helps businesses accept online payments via credit card, debit card, net banking and mobile wallets from their end customers, has over 5,000 merchants including the likes of Papa John's, Knowlarity, Chai Point, Nestaway and Eatfresh, among others. Razorpay competes with well-funded players such as Citrus, CCAvenue and MobiKwik in India. The digital payments segment has seen a lot of investments lately with the most recently one being digital payments firm TranServ Pvt. Ltd securing $15 million (Rs 100 crore) in its Series C round of investment led by venture capital fund IDFC SPICE and consumer electronics maker Micromax Informatics Ltd.
Juspay Technologies Pvt. Ltd had raised $5.8 million from venture capital firm Accel Partners and BookMyShow founders Ashish Hemrajani, Parikshit Dar and Rajesh Balpande, in February this year. In August last year, mobile payments service provider Ezetap Mobile Solutions Pvt. Ltd had raised Rs 150 crore ($24 million) in Series C funding from existing investors The Social+Capital Partnership, Helion Advisors, Berggruen Holdings, Horizons Ventures and other investors.